Stuart’s books are yucky, funny, imaginative and exciting enough to engage even the most reluctant of readers, yet with a stretching vocabulary that suits more developed children. Stuart told us he is the funniest author in Scotland – having seen him we can’t disagree. Stuart Reid is one of the busiest children’s authors in Britain today, performing at schools, libraries and book festivals throughout the UK, Ireland, Dubai, Abu Dhabi. He has hosted over 100 book events at the Edinburgh Fringe Festival, and in 2017, Stuart received congratulations for his work with the First Minister's Reading Challenge “Fantastic. Well done.” Nicola Sturgeon. Stuart pursued his dream to become a children’s author by quitting his lucrative job in Dubai, where he was the first international general manager for the UK hotel chain Premier Inn. He had been writing a 2000 word blog every week talking about Middle Eastern life and opening hotels in Dubai which received 20,000 hits per month and was the most viewed on the company internal website so he decided to make it his career. The six books in Stuart’s Gorgeous George series have been met with widespread enthusiasm and international acclaim from young readers and the first four titles have even been translated into Turkish. The books were written to encourage children, especially boys and reluctant readers, to want to read more often. 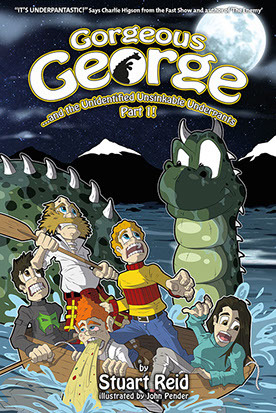 These storylines feature the characters Gorgeous George (a not-so-gorgeous 10 year old boy) and Grandpa Jock (his eccentric Scottish grandfather). 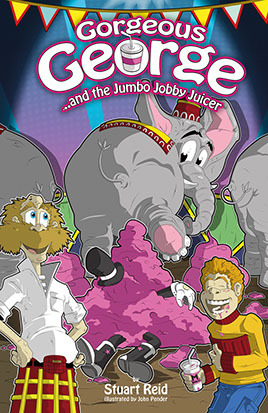 The books are yucky, funny, imaginative and exciting enough to engage even the most reluctant of readers. Stuart’s books are yucky, funny, imaginative and exciting enough to engage even the most reluctant of readers, yet with a stretching vocabulary that suits more developed children.